Bob Smith helped us with this OSSA. He met a guy named Ed Hollander camping in Florida and as they talked, they learned that both raced motorcycles in their younger days! Mr. Bob mentioned he rode an OSSA – Ed perked up and said he raced and still owned a Stiletto! 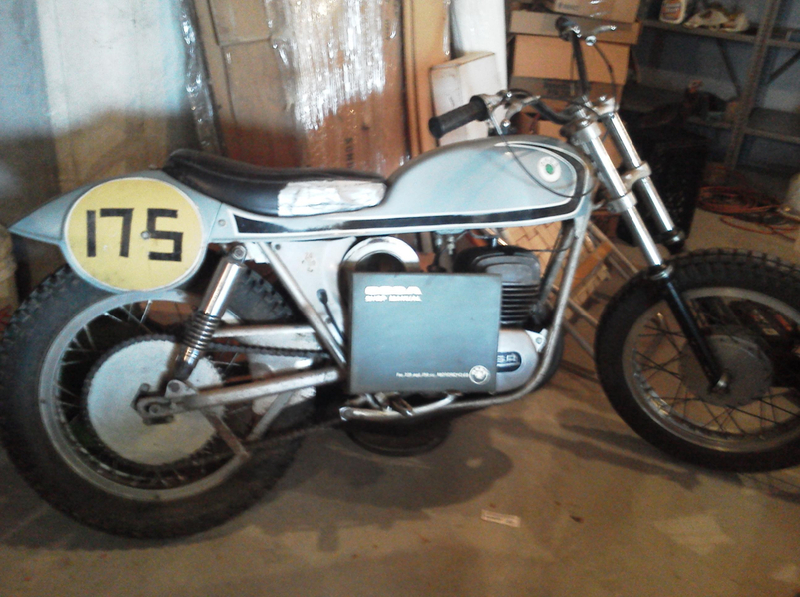 Fortunately for me, Ed was willing to make a deal and sell his very original 175 OSSA! Displayed is the bill of sale from Joan’s Chain & Sprocket in New Jersey and the statement of origin from Yankee Motors in Schenectady, New York. Ed raced this bike at the North vs. South Scrambles at Dorsey, Maryland in 1971! I’ve done some clean-up, replaced non-original parts with factory-supplied units, cleaned the tank, added some new premix, and guess what – it runs! And it’s LOUD! 70 ossa stiletto from Mike Slate on Vimeo.